I hope you’re enjoying the holidays and the festive atmosphere everyone seems to have this time of year. If it’s cold outside, at least there seems to be warm smiles wherever you turn. Anyway, with New Years’ Eve fast approaching I thought a good recipe to share would be my mini apple pie recipe. Whether you’re hosting a New Years’ party or just attending one, finger foods and buffet-style will probably be the main player for the evening. So why spoil the evening with a non-finger food dessert like a big cake or pie or something else? I’ve got the perfect solution for you: mini apple pies. But wait, there’s more! Not only are these little apple pies individually sized, they also use peanut butter and coconut flakes for healthy fat and a unique twist on an American classic, honey for sweetening and rolled oats for part of the topping. They’re quick and easy to make (you may already have all the necessary ingredients at home) and they store and travel really well. All you need to do before eating is reheat in the microwave and drizzle a little extra honey over the top. Trust me, when you’ve got desert covered ahead of time for the party (or whenever, really – they’re good all year round), you’ll be very happy it’s done. Happy New Years’ and I’ll see you all in 2015!! Place 1 tbsp. of peanut butter in the bottom of four 6 oz.-glass ramekins or baking bowls. 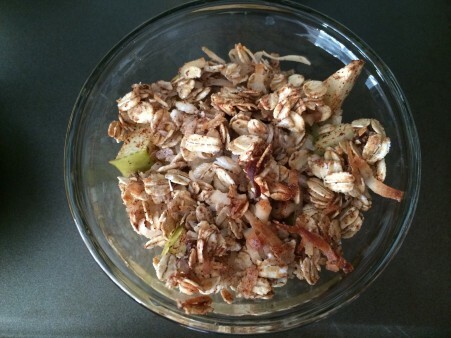 Combine the oats, coconut flakes, 1 tsp. of cinnamon and the honey in a small bowl. Mix until well combined. Core and chop up the Granny Smith apple into chunks and place in a separate bowl and add lemon juice, nutmeg and remaining cinnamon and mix. 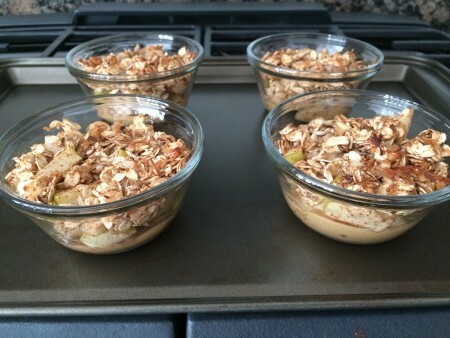 Divide up the apples evenly among the ramekins, then sprinkle the oats and coconut flake mixture on top. Bake for 15 to 20 minutes and drizzle with extra honey, if you desire. Serve warm for the best taste. Doesn’t this look amazing – and it’s so simple to make too! Dessert’s ready in a snap. This entry was posted in Desserts, Recipes and tagged Apple, Apple Pie, Cinnamon, Coconut, Desserts, Easy, Easy Dessert, Healthy Fat, Honey, Mini Apple Pie, Oats, Peanut Butter, Pie, Quick, Recipes on December 28, 2014 by Paige N..